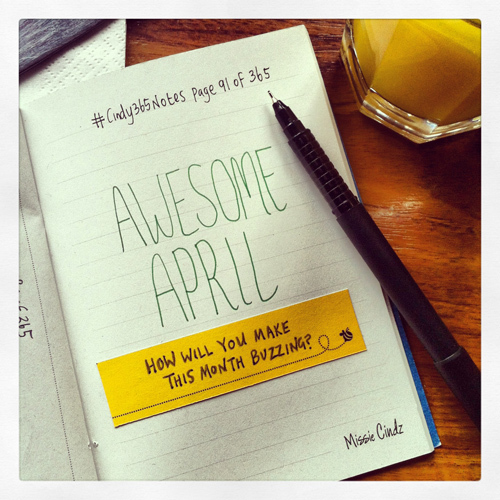 Awesome April – how will you make this month buzzing? New month, new creative goals and a heap of new food dates! Let’s ALL aim to make April deliciously AWESOME! But, how will you make April Awesome? Discovering a new foodie joint perhaps? …mastering the art of making perfect pastry? …giving real bread to a hungry person? or perhaps trying to finish off that WordPress blogging website you said you’d try to have up and running by March? – whatever it is, having goals on a daily basis stops us drifting off in the wrong direction and keeps hunger at bay; they act as reminders to getting things done. My mission in life has always been simple – to inform and share my love of food to encourage communities to enjoy a deliciously creative adventure of their own. Through food I’ve come to experience, when fused with like-minded people it is much more than just fuel for our body; food is emotional, familial, ethnic, social, and cultural. Food is a metaphor for building community. But I can’t always make the biggest impact on my own. We all need some help at some point. I want some help and I’m looking for you – people who share my enthusiasm and commitment to quality and improving the well-being of readers, our communities and society. As I get to meet and reach more and more enthusiastic people every day, I’m building a community of services, businesses and brands who want to help people make better choices. So, are you a hungry? Do you want to join the Missie Cindz community? Drop me an email and let’s work together to create new memories and experiences at the same time inspiring the world to make meaningful choices.